I really enjoyed the King's Meadow setting in Robin's book A Promise Kept. Love Without End takes us back to this wonderful little community and into the lives of Kimberly and Chet. Both single parents to teenagers they are both getting through life unsure of what the future may bring. Kimberly is used to the city and is afraid of horses yet her daughter can't seem to be around them enough. 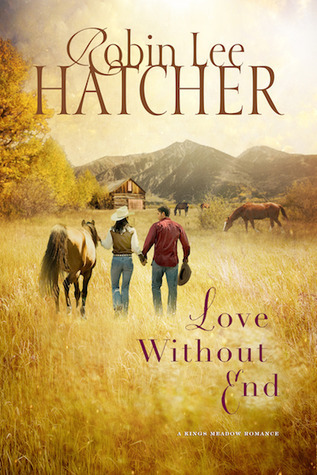 Chet offers to help Tara learn more about horses and Kimberly ends up being around them and a cowboy she wants nothing to do with. This story is predictable but I really liked reading it because it's a real story. Their families aren't perfect and at the end not all is solved. There is a side story about Anna who returns to the ranch and the readers get a glimpse into her past. I like the flashbacks, similar to those in Hatchers' previous books. This is a nice easy read, don't expect a ton of romance just a realistic portrayal of life written beautifully. I really enjoyed, highly recommend for a contemporary fiction!